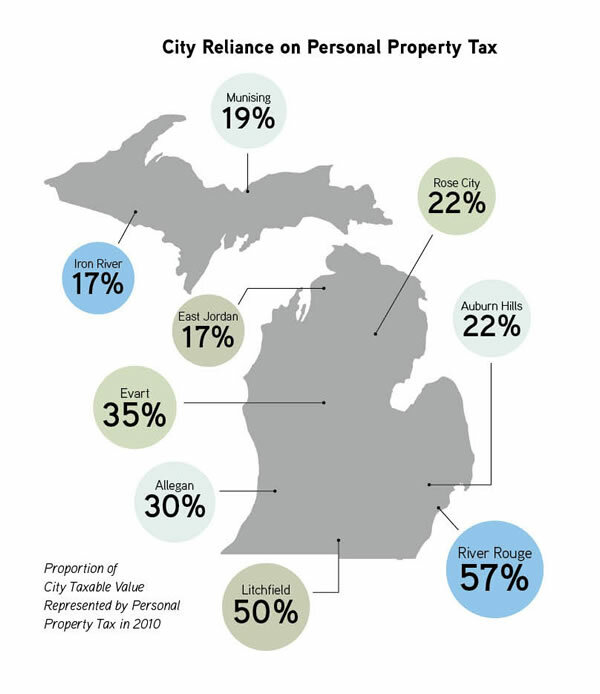 On the final day of the 2012 legislative session, Michigan lawmakers passed a package of bills to phase out business personal property taxes over ten years, giving businesses a $590 million annual tax break. However, there's a major stipulation included in the legislation. It won't go into effect unless voters approve it. Under the plan, commercial and industrial property with a taxable value less than $40,000 per jurisdiction would be phased out beginning in 2014. In 2016, the tax phase out would be available to larger businesses. Personal property taxes would be completely repealed by 2022. The repeal bills are Senate Bills 1065, 1066, 1067, 1068, 1069, 1070 and 1071. About 80% of the lost personal property tax revenue would be replaced by the state with use taxes. Local tax jurisdictions would also have the ability to institute a special assessment to make up the other 10%. The reimbursement plan is detailed in House Bills 6022, 6024, 6025 and 6026. On the other end of the spectrum, some other cities get almost nothing from business personal property taxes. The personal property tax phase out plan requires a statewide vote of the people in order for use taxes to be diverted to local governments. Simply put, if the statewide vote fails in August 2014, personal property taxes will remain in effect.